Wholesale Accessories Great for Shops, Flea Markets, Online Retailers, and More! Let your customers show off their wild side when carrying cell phones with our terrific selection of wholesale Western cell phone cases. Featuring a wide variety of genuine cowhide leather cases with Velcro closures we offer a great selection of discount cell phone cases in chic patterns including faux zebra print and traditional black or brown. With a strong metal clip on the back to attach easily to pants and belts and a front flap decorated with a variety of dazzling rhinestone ornaments including stars, pistols and crosses our wholesale western theme cell phone cases are great accessories that can fit current iPhone, Droid and Blackberry model phones. Best Handbag Wholesale, the Internet's best seller of top quality wholesale handbags, Western apparel, women?s wallets, and accessories, has an exciting new category: western style phone bags. The ideal way for someone who loves Western fashion to carry a cell phone is with a stylish phone bag from Best Handbag Wholesale. You'll enjoy low wholesale prices you can pass along to your trendy customers. Our exciting line of western style phone bags come in chic patterns with shoulder straps and strong metal clips that attach easily to pants and belts. And our phone bags are available in trendy colors, like the turquoise iPhone bag with a rhinestone skull and crossbow ornament that stands out on the leatherette top. 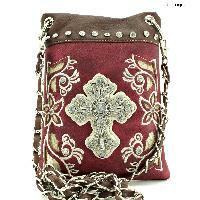 All of our phone bags feature Western theme rhinestone ornaments, including stars, pistols, and crosses. They also carry an array of the latest cell phone models, including iPhones, Androids, and Blackberrys. Don't miss out on the latest trendy accessory for Western themed retailers or e-commerce sellers. Our phone bags are selling like hotcakes and our site is easy to use, so sign on today to take advantage of the great wholesale prices with special shipping options, including free for orders over $500 and a flat $10 fee for orders from $100 to $499. Everyone carries a cell phone today, and now they can carry them in a stylish Western phone bag from Best Handbag Wholesale. Call us toll-free for the trendy details at 866-787-7371.